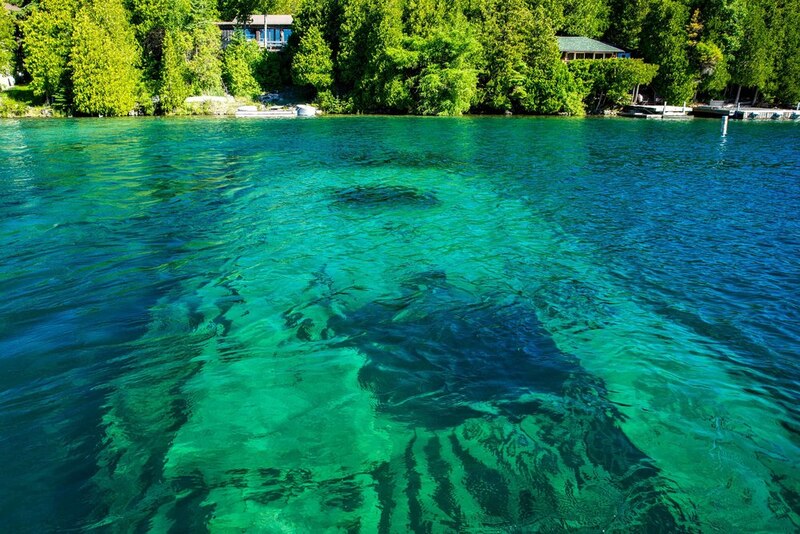 Ah, Tobermory… what can I say? Amazing… beautiful… fun… fantastic… Tobermory is one of those special places that we knew we’d love the moment we saw it. We were supposed to check out some other places in the 2.5 days that we spend in Tobermory, but we didn’t. We couldn’t leave… it is just that great! Tobermory is at the tip of the Bruce Peninsula, which is the peninsula that lies between the Georgian Bay and the main basin of Lake Huron. When planning our trip, we had to decide whether we’d stay at the base of the peninsula, which is the home of some well-known towns, or go all the way up the peninsula. 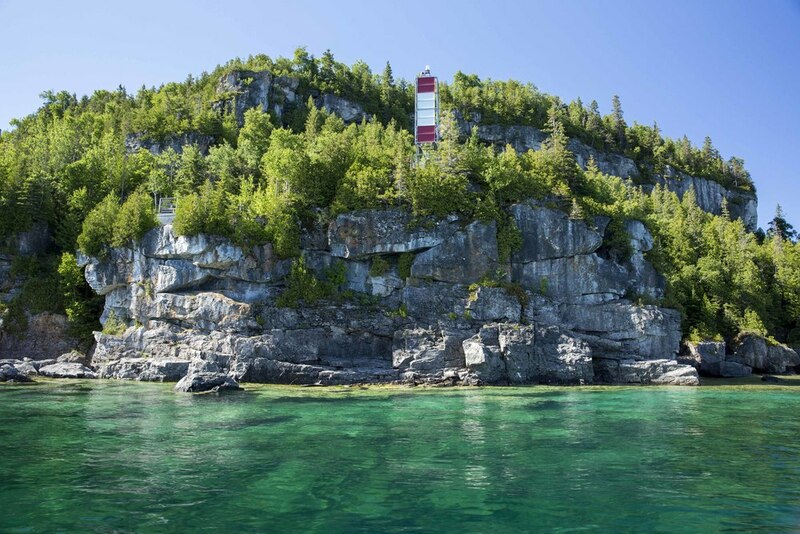 We heard that Tobermory is beautiful and when I researched campgrounds I found one in Tobermory that fit our profile… so we went all the way up the peninsula. From Goderich, we drove north on Rt. 21 until it junctioned HWY 6. At HWY 6 we headed north up the peninsula and into Tobermory. We stayed at Land’s End Park, which is just 2 km from town. After a couple not-so-great campgrounds at the beginning of the trip we are on a role… Lands End is awesome! The sites are fantastic, the campground is very natural and quiet, and the staff is great. The campground store is well stocked and also offers non-motor boat rentals like canoes and kayaks. The bathrooms are adequate and there is plenty of hot water. After getting settled we headed to town to kick off a fantastic 2.5 days exploring the area. 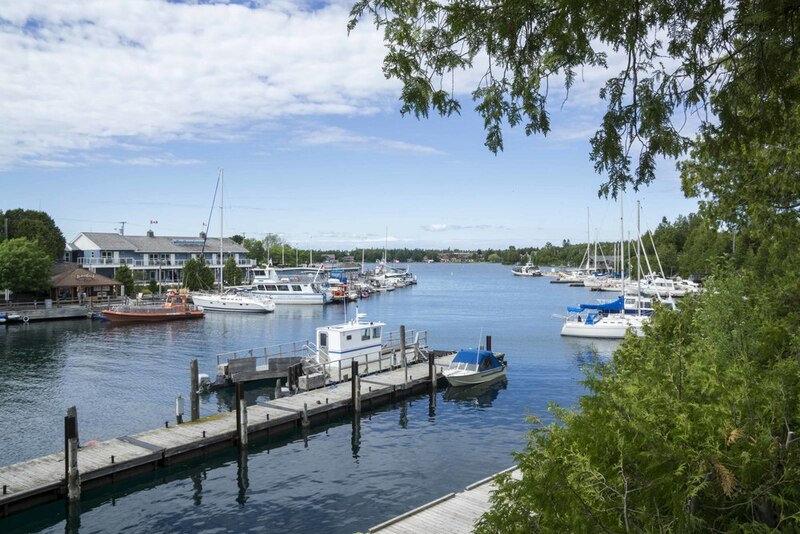 There is a little harbor in Tobermory with a marina and lots of shops and restaurants. The vibe is very energetic, fun, and welcoming. Everything a visitor needs is in the harbor… grocery store, liquor store, and coin laundry. 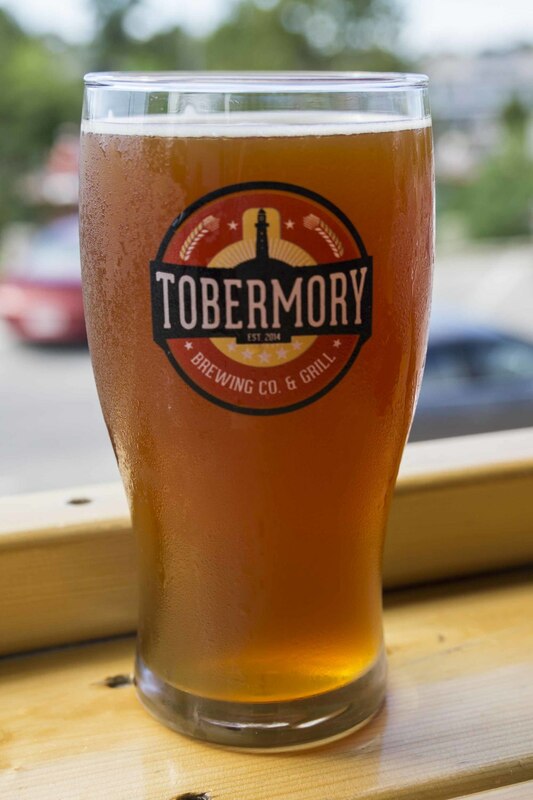 When researching Tobermory we noted that the Tobermory Brewing Co. has fantastic reviews for food as well as beer… it’s by far the highest rated restaurant in Tobermory. Did it live up to the reviews? Yes and then some… it was hands down the best meal we’ve had on the trip so far, and we’ve had some great meals! We sat outside on the front porch overlooking the harbor… super casual and very welcoming for families. 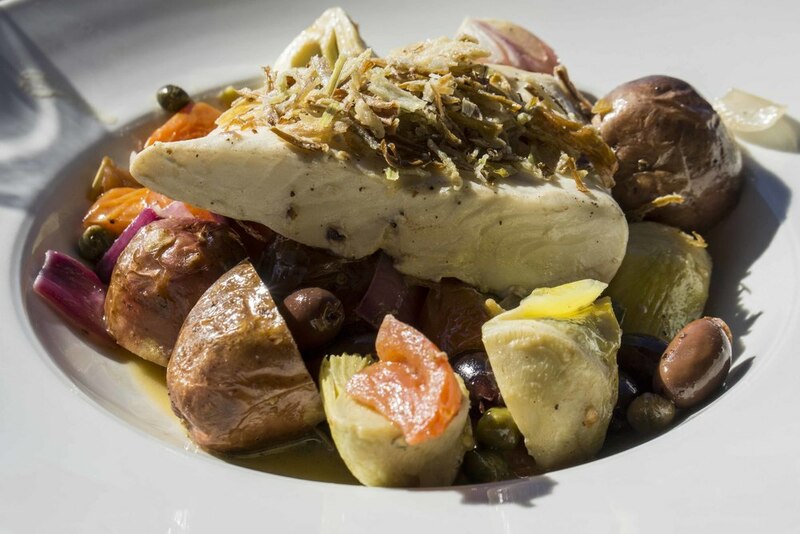 Daniel ordered a burger and Todd and I ordered fish dishes… braised Mediterranean halibut and organic Manitoulin trout. They were very different and creative preparations and were awesome! The service was also great. Tobermory Brewing Co. was great way to begin our time in Tobermory! 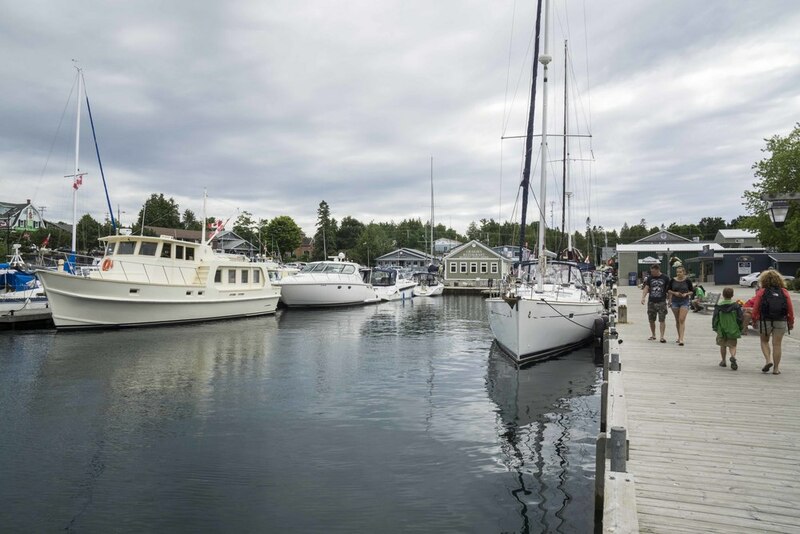 There are a couple boat companies, Bruce Anchor Cruises and Blue Heron Company, in Tobermory that run multiple daily trips through the Fathom Five National Marine Park including stops at Flowerpot Island. We were a little confused when looking at what each company offered and needed to ask some questions before deciding… what follows is our take on what’s available. Both companies’ boats have glass bottoms for viewing shipwrecks. 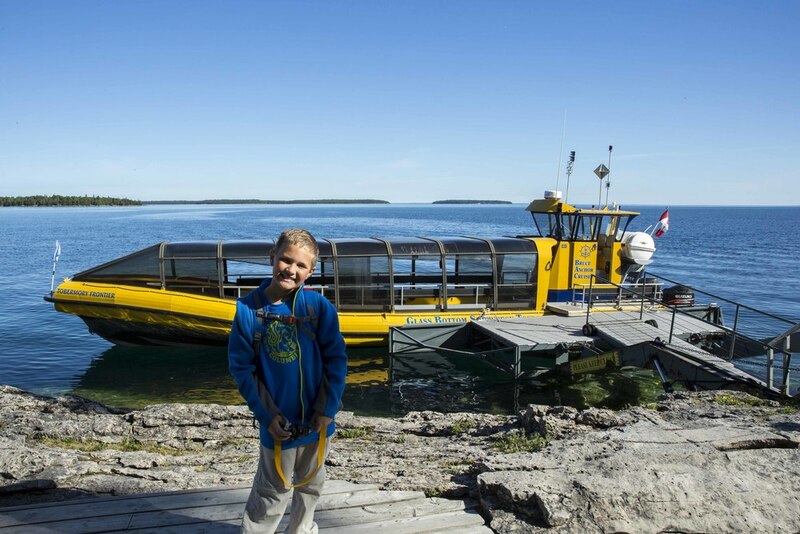 Both companies offer options to disembark at Flowerpot Island and get picked up later, or to just stay on the boat. Both companies visit the shipwrecks on the way to Flowerpot Island. The price differences aren’t material. The major difference we noted is that most of Blue Heron Company’s boats are very large and slow. They do have one smaller fast boat, but it isn’t covered. All of Bruce Anchor Cruises’ boats are smaller and faster. Some are covered and some aren’t. We preferred the smaller, faster, covered boat and ultimately decided on Bruce Anchor Cruises. We booked the 9:25am boat (one of the first of the day) and highly recommend taking an early boat… the morning light is great and Flowerpot Island is much less busy early in the day. We loved our tour through Fathom Five Marine Park and Flowerpot Island! Our guide on the boat, Travis, was fantastic. Daniel and a couple other young boys on the boat had lots of questions and he was very patient with them. He is very knowledgeable about both the Marine Park and Tobermory and gave us some great recommendations for the rest of our stay. 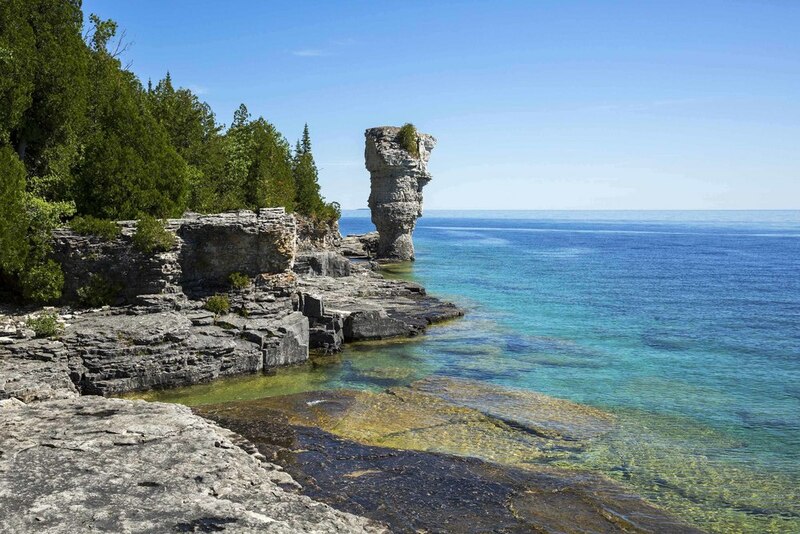 Once on Flowerpot Island we hiked to the flowerpots (natural rock formations that have formed over thousands of years) and lighthouse. It took us about 1.5 hours (with stops at each place to enjoy the beautiful scenery). We would have liked another 30 minutes on the island, but the next boat was 1.5 hours later, which would have been too much time. Overall, this little adventure was fantastic and we highly recommend it for anyone visiting Tobermory! We got back to Tobermory at lunch time and stopped at the Crowsnest Pub in the harbor. Crowsnest has a large patio overlooking the harbor and parking both in the harbor and in a lot off the road in back of the harbor. The menu has something for everyone… Daniel ordered pizza and Todd and I ordered Greek Salads. All of the food was good, the service was great, and the atmosphere was perfect for lunch on a beautiful day. Next stop… Bruce Peninsula National Park and the home of the grotto, which is a rock cave on the shore of the Georgian Bay that’s been formed over thousands of years. As light peeks in the beautiful water is illuminated. The grotto is easy to get to… hike about 30 minutes from the Cyprus Lake Road parking area. Once there, getting into the grotto is a little more challenging. Daniel and I passed and Todd went in. Any teen or adult who’s in decent shape should be able to do it. We didn’t feel comfortable having Daniel do it because it requires careful movement on slippery rock and he needs more experience with this type of hiking in less dangerous spots before giving something like this a try. Indian Cove is right before the grotto and is really beautiful… a large cove with water of all different colors. It’s definitely worth checking out. When leaving the grotto we decided to hike back a different way than we came. The hike to the grotto was not challenging… large well marked dirt paths. The hike back was fine for us, but may be challenging for someone with knee or hip problems… lots of rocks. In one area we crossed what’s called boulder beach… it’s named that because instead of sand there are large rocks. Before heading back to the campground we headed to a spot that we passed the day before on our bike ride. Bootleggers Cove Pub is on Big Tub Rd. on the way to the lighthouse. It has a large deck on the water that caught our eye. We enjoyed some refreshments and took in the scenery. The menu has some salad options, bar food, and pizza. We weren’t ready for dinner, so we didn’t eat other than Daniel got some chicken fingers. We had a great time talking to the staff and learning more about Tobermory. Bootleggers is a great spot if you’re looking for great scenery that’s a little out of the way and very relaxed. Interested in visiting Tobermory? There are several campgrounds, several small hotels, bed and breakfasts, and cottage rentals. From what we were told, it gets very busy in July and August and it’s best to book ahead of time. It’s also the home of the Chi Cheemaun ferry to Manitoulin Island that runs several times a day during the summer. Our conclusion… Tobermory is a fantastic and special place!